Having smoked my share of duds lately, it was time to reach for a reliable treat. Old school “Pepin whores” will be familiar with this selection — the Habana Leon A.
Blended and banded to resemble the Cuban Partagas, Habana Leon was one of the private labels (along with Havana Soul, Nacionales W, Sancti Spiritus, Hirsh y Garcia and Cuban Diplomat) produced by Pepin Garcia for Cigar King before Senor Garcia was a household name. For many, including myself, these CK house brands served as the introduction to Pepin’s now-legendary blending style. Aesthetically, these Miami-made 9.25″ x 48 monsters are stunning. When I acquired my box about two years ago, I was dazzled by their uniformity. Pulling them from their cello sleeves for aging, I found each to be absolutely perfect with silky smooth wrappers (Nicaraguan corojo from the 2000 harvest) and neat triple caps. Not a blemish, lump or soft spot in the box. Clones. This smells like a DPG creation from the instant I put flame to the foot. It draws well, almost effortlessly. The Habana Leon is reportedly filled with 70% ligero, but there’s nothing in-your-face about the first third. There are pronounced peanut and cashew notes along with sweet, tangy cedar. I should note, however, that the cedar is almost certainly a product of “naked” box aging. Those aging in the original cello will probably not pick up this flavor as strongly. Around the one-third mark, the pepper picks up, followed by the first hints of earth. Though this hasn’t always been my experience with this smoke, it changed gears rather suddenly. 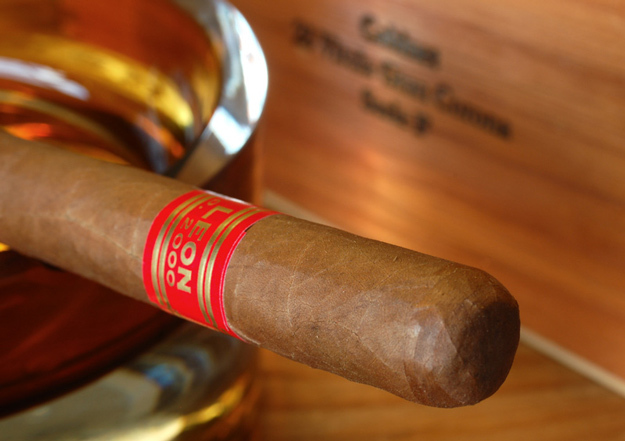 By halfway, the nuts and cedar take a backseat to Cubanesque earth, spice and leather. I also pick up some cocoa on the finish. To my palate, the Habana Leon doesn’t resemble the Partagas as much as it does the Saint Luis Rey Serie A. The pepper backs off after a pretty intense 15 minutes, and earth becomes dominant. Nuts and wood from the opening third are still present, but it’s the twangy, SLR-like earth that drives this smoke for the final four inches. It is rich, but not overpoweringly strong. And while it clocks in at around two hours, it is never a chore. The value is, or was, stellar. I paid $150 plus shipping for my box on special. At $6.00 per stick, these are amazing. However, I just checked the CK website and was stunned to see these listed for an insane $599.00 per box! I was aware that CK had raised prices on their remaining stock of DPG-made house brands, but $24 per stick is absurd. I’m afraid Mr. Hirsh has lost his mind. CONCLUSION: The Habana Leon A is among my favorites. The appearance and build are top notch. It also has outstanding dynamic range. It begins like DPG’s lighter, nuttier fare (a woodier Padilla Achilles, perhaps?) and closes on an earthy, Cubanesque note more comparable to a Tatuaje Cabinet. I can’t recommend the A at its current price, though I feel safe recommending the Habana Leon Churchill at $8.00 per stick. Great review. I have had the toro size in this line and loved it. Stopped by CK on a cross country trip and was super disappointed. Beetles everywhere and none of the employees seemed to care. Needless to say with prices hiked and the beetle infestation that I witnessed I will never purchase from them again. Thanks, Jeremy. I took your advice on CK. I was going to reload on Nacionales Ws, but punted after hearing your report of beetles. And the price hikes are indeed crazy. At one point, I think $269 was the regular price on the A size. Now $600? If we assume for a moment that $150 was at or near their cost, then they’re now selling them at a 400% markup? Who does that?! The price increases at CK were a blood-draining experience for me. I expected them to go up, naturally. Supply and demand. Laissez faire. But beetles? Well, you say you want a revolution… damn. For once I think I believe in the redistribution of wealth. $600 a box? Let them eat Habana Leons! What a disaster. Indeed. The thing that’s weird is how randomly they re-priced the A size. The other sizes went up something like 15%, and this size more than doubled. Were they expecting an unprecedented run on A’s? Anyway, I’m tempted to offer them back to CK for $18/stick or so.